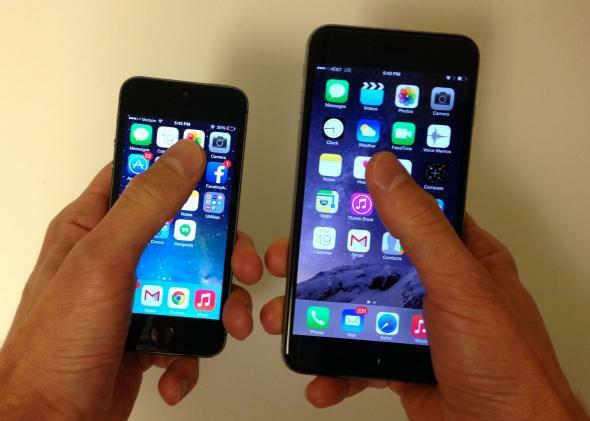 iPhone 6 Plus size vs iPhone 6: Why I might return Apple's giant new iPhone. As I stood in line at my local AT&T store Friday morning, preparing to plunk down $399 on Apple’s next big thing, a fear crept into my thoughts: What if the iPhone 6 Plus is too big to fit into my pants pocket? Am I going to have to start carrying a purse? This, of course, is not a novel problem. Half the smartphone-buying population has been grappling with it stoically for years, because the pockets on women’s clothing tend to be Lilliputian. Only with the growing popularity of “phablets” like the 6 Plus and the Samsung Galaxy Note, however, has the pocket-or-purse dilemma begun to affect men. Predictably, we’re freaking out. As it turned out, however, I had no problem sliding the iPhone 6 Plus into the pockets of my Uniqlo chinos. One of my colleagues, whose sartorial taste skews toward elfin hipster jeans, had somewhat more difficulty when he tried my new phone on for size. I’m guessing he’ll opt for a smaller version. Yet just as I began to rejoice that I hadn’t wasted my money on a phone I couldn’t carry, a different drawback became apparent: There’s no easy way to use the device with just one hand. Over the years, I’ve grown blithely accustomed to the notion that operating a smartphone is a single-handed endeavor. Not only can I comfortably cradle the iPhone 5 in my palm, but the tips of my fingers have no trouble reaching the farthest corners of the screen. I’ve even mastered the art of swatting home runs one-handed on my favorite little time-wasting mobile game, 9 Innings Pro Baseball. No more. Just typing in your passcode to unlock the 6 Plus requires either a second hand or a feat of manual acrobatics. Reaching the top buttons on the home screen—you know, trivial things like “messages,” “photos,” and “camera”—is out of the question, unless you’re Kawhi Leonard. When Apple announced the 6 Plus, I noted that it had included a feature that allows you to pull the top buttons halfway down the screen by double-tapping the home button. I did not anticipate that I would quickly come to rely on this feature for almost everything I need to do on the phone. That might sound like a small difference. If you use your phone a lot, it isn’t. It nearly doubles the amount of time it takes to complete certain tasks. And while the double-tap feature makes it relatively easy to reach the top of the screen, it remains a struggle to reach the sides without dropping the device altogether. Two of the people to whom I briefly loaned the phone managed to fumble it within the first 30 seconds. This is how far my thumb can reach on the iPhone 5 (left) and on the iPhone 6 Plus (right). The obvious solution is simply to use two hands at all times. I get that. The 6 Plus works beautifully in landscape mode, and its spacious screen shines when it comes to reading articles, watching videos, or playing games. Its battery life, reputed to be significantly longer than that of the iPhone 6, was a major selling point for me. Like the Galaxy Note, this is a phone that some people will love even as others mock and eschew it. I have a feeling that my father, who happily sported a bulky Handspring Treo at a time when everyone else was buying Motorola Razrs, will be a fan. Unlike the Galaxy Note, however (or the Treo, for that matter), the 6 Plus doesn’t come with a stylus, and it wasn’t explicitly marketed as a compromise between a phone and a tablet. No Galaxy Note buyer should be surprised to find that her device is ungainly. Apple addicts, on the other hand, may have been lulled by the company’s marketing to believe that it would never sell them a phone that didn’t feel Mama Bear’s–chair perfect in their palms. A device that requires two hands is a device that demands your full attention. It’s not a device you can whip out of your pocket and glance at quickly in between other tasks. It’s not a device you can use to quickly scan your email while carrying a grocery bag or hanging onto a subway pole. And perhaps that was Apple’s intention all along: An awkwardly sized phone might be just the incentive some people need to buy a $350 smartwatch. I’m not ruling out the possibility that I’ll eventually grow dexterous enough with the 6 Plus that its virtues begin to overshadow its limitations. But at this point, I’m also not ruling out the possibility that I’ll be back in line at that same AT&T store within two weeks to exchange it for something more manageable.